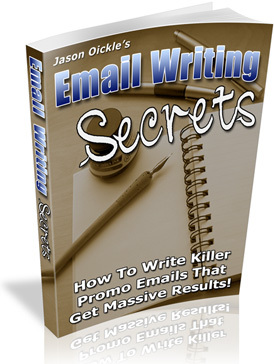 Email Writing Secrets - How To Write Killer Promo Emails That Get Massive Results! Are You Getting The Results You Deserve From Your Email Marketing Campaigns? "I'm About To Finally Pull Back The Curtains On How YOU - Or Anyone - Can Chalk Out Your Very Own Profit Sucking Promo Emails That Moves Your Readers To Buy At Will!" Writing Promotional Emails Is One Of The BEST Skills You Can Ever Master In Today's Competitive Market... And You Will Do Well To Read This Letter URGENTLY Because In Just A Few Minutes, You Will Learn How You Can Turn Your Pen Or Keyboard Into A Wealth-Generating Weapon! Produces a minimum click through rate of 10-20% and potentially as high as 30-40%. Generate massive sales for you... even though your mailing list is small. Move your readers to open and read your email with interest. Getting your readers to take action such as downloading gifts, signing up for a privilege and so much more! "My mailing list isn't responsive." "Aw... I've built a list of freebie seekers and freeloaders!" "I've sent an email to my list but no one ain't buying anything." In other words, It's not something you can master literally overnight. I know you're reading this letter hoping it's easier said than done, but I'd be lying if I say so. Naturally, people have a poor choice of words hence poor results are produced even after they have broadcasted their emails out to their mailing list. And UNLESS you're not pushing the HOT buttons, you aren't going to move majority of your readers much less press them to take action of some kind. You don't have to kidnap a guru to teach you how to do it. You don't have to invest thousands of dollars in expensive coaching fees, either. And you absolutely don't have to be guessing in the dark all the time. For The First Time Ever... Here's A Low-Cost Alternative To Mastering The Skill Of Writing Persuasive Emails That Move Your Readers In Your Favor... And Start Making High-Profits Today! 34 Letter-size pages, PDF format, Instant Download! The 4 main purposes and focuses you can use in your emails to move your readers at will! All of what you need to know before writing every profit-pulling email promos! The most dangerous 1-letter word you should refrain from using too many times - or your email will get killed instead! The one nifty tool every top notch email marketer must have - I will also show you how to get it FREE! 6 different types of powerful email promos you can write on any occassion! How to maximize your email open rate through the head of your email and get them opened everytime! The ingredients of a powerful subject line that gets your email open instead of getting deleted! How to make your email opening catchy and beef up the reading interest in your subscribers! The distinct razor-edge that will your keep email shortlisted out of the many emails your subscribers receive in their Inbox! The success factor that hypnotizes your reader to take action... leading all the way up to your intention i.e. purchase your product, sign up for something, download a freebie, and more! How to enforce your email letters with powerful post-scripts at the end of your letters! Take Action Now... and see an increase in your mailing list response rate, email open rate and click through rate! Take Action Now... and watch a turbulent surge in your sales every time you run a promotion to your mailing list! Take Action Now... and be able to move and "hypnotize" your readers at will - in your favor! 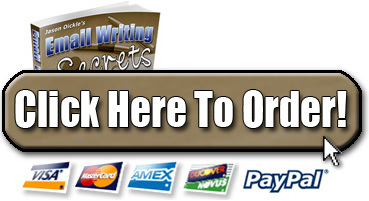 Take Action Now... because How To Write Killer Promo Emails is yours to keep for only $17.00. At this price, it's a fair trade for better results and it certainly beats shooting in the dark and suffer costly financial mistakes. Think about it: for a small price, you can join the ranks of TOP Internet Entrepreneurs and email marketers without having to invest thousands of dollars in coaching just for this "specific area" of Internet Marketing... or even kidnap another guru! Full Master Resale Rights Included! That's Right, Order Right Now And You’ll Automatically Receive Full Master Resale Rights So You Can Sell This Hot New Manual At Any Price You Wish And Keep All Of The Profits Yourself! If you're interested in selling this product yourself, I'm sure you realize that the sooner you get a copy, the more you will profit. The longer you wait, the more your competition will pick off your customers. Your Purchase Is Backed By My 100% Satisfaction Money Back Guarantee! That's correct. You have a full 90 days to check it out and apply to your email promotion writing. I guarantee you that when you apply what I share with you in my manual, you will see dramatic results in your response rate from your emails to your subscribers or members. If you're not satisfied for any reason whatsoever, shoot me an email to let me know in these 90 days after your purchase. Delete the manual from your hard drive and I'll refund your purchase. No questions asked. I'm shouldering all the risk for you so you don't have to! There's no excuse for you NOT to be the next TOP email marketer. Order now. P.S. Writing killer promotion emails is likened to an essential survival skill in the E-Commerce jungle. If you don't have it, you won't be able to survive the competition. So invest in learning this priceless skill now and guarantee your future success! P.P.S. I am aware that not everyone has hundreds of dollars much less thousands of dollars to master this skill, even though I believe that no monetary value can really tally up with this priceless skill. I heard you, nonetheless. That's why I've conceived this manual at a price you can afford! P.P.P.S. Remember: your purchase is backed by my 100% satisfaction money back guarantee so you cannot lose but have all to gain!